Will it be Darjeeling, or Earl Grey? I’m waiting for snow. Since I’m waiting, it won’t happen. I’m tired of too-warm temperatures and damp, heavy air. It’s January, and it’s not supposed to be like this. Today is cold and the clouds have been building. There’s hope yet. Knitting continues on the Kureyon socks and the Japanese Vines scarf. Progress has been made, but I don’t need to show the same two pieces again, do I? I’ve finished half of the second sock and a little more than half of the scarf. In a few days I’ll be ready to think about the next new thing, or maybe this is the time to finish some of the things I’ve been neglecting. I’ll be hanging around the house for a couple of days this week, recovering from another — I can’t type it — isdom-way ooth-tay ing-thay. This will be the last, but it’s the lead-in to the next part of a long process. Will I still have readers after I spend the next six months alluding to frightening dental procedures? I’ll try to spare everyone the details, but the end result will be a happier and healthier Jane. That, and the extra knitting time I’ll get when I have to take a sick day here and there, makes it worth it. Sweet Jane,Honey, you will always have many readers & you will always have many fans. 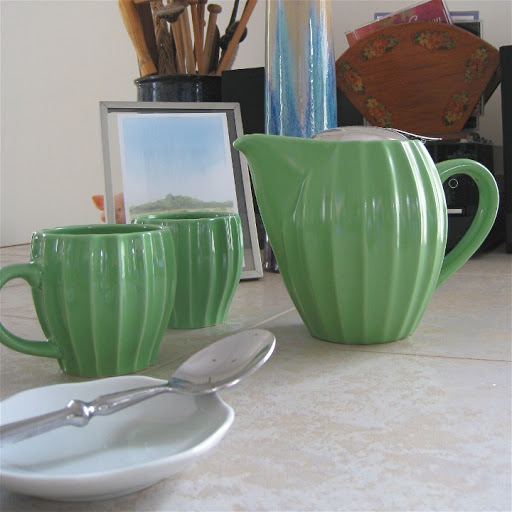 I’m in both of these camps ^ .. ^Love the tea cozy & the tea pot it fits over – both are pretty.Much luck w/ the ooth-ay stuff. Extra Vitamin C helps the health of your gums & your overall health. (Am a former dental hygienist.) Lotsa XOXO to you & Annabelle. Pretty tea cozy and tea pot (and cups, too!) I hope all goes well with the ouchy stuff. That’s such a nice tea pot and cozy! I hope all of the dental stuff goes smoothly. Either way, we’ll still be here. Glad this is the last of the isdom-way ooth-tay removals. Yikes. 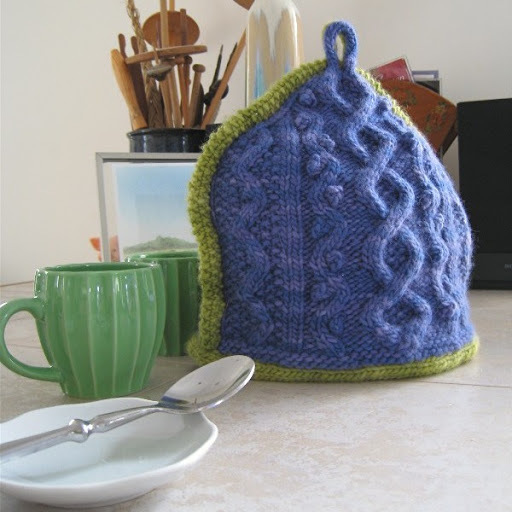 That’s a big deal, even though it seems like it isn’t.Your tea cozy is incredible! Truly exquisite! Wow! Pretty! Green is always good.Good luck with the tooth thing. Getting rid of mine made for so many less migraines. I hope your results are equally wonderful. Now I am mad to knit a tea cozy. And get a teapot, especially one as awesome as yours. Good luck the dentist. Oh, I hope you are soon feeling lots better. Your tea cozy is just wonderful. Oh Jane, that teapot is stunning! And the cups too. The cozy is now complete – and I love thinking of you at home sipping tea and progressing on your “ental-day ourney-jay to ellness-way.” I’ll hold good isdom-way ooth-tay thoughts for you. You WILL get there and you will feel so much better – and we’ll all be here to support you along the way. Love it, Jane…I just love it!